I was the first teacher in my school to have a Smart Board and before it was delivered, I had never even seen one. I spent hours and hours of my own time learning to successfully navigate Smart Notebook. I’ll never forget spending two entire hours trying to figure out how to re-write a program based on popping balloons! In our profession, time is at an absolute premium. We work so hard to get our students the resources that they need and we spend countless hours lesson planning and data tracking. I loved my Smart Board, but I was hard pressed to find the time necessary to create and utilize the programs available. Imagine 33 kindergarten students learning letter sounds cooperatively at a Smart Board and you’ll be picturing my classroom just a couple of years ago. Then one day I received a link to Gynzy via email. I signed up for a free trial and I was in complete disbelief at how user-friendly and easy to implement it was.Now, I love my Smart Board. I love that it easily engages students, I love that I can store tons of information and access it all easily, I love that it seems like magic…even to second graders. I have taught with a Smart Board in both kindergarten and now in the second grade. With my second graders I start the day with “Morning Routine“. Students each take turns and now that we’re used to the routine, it takes us just minutes…. and the bonus? More room on my bulletin boards since our calendar is interactive. 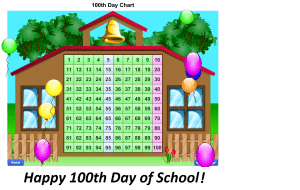 Another daily activity is the 100th Day Chart. Together, we count the days until the 100th day of school. A Math tool I really like is “Paying with Money” and countless other lessons for transitions and small group practice. I’m not a fan of spending hours searching for viable programs written by other teachers that require me to read lots of notes and implement countless changes. Instead, I click on Gynzy and we start learning. Thank you, Gynzy, for saving me time and helping me to successfully integrate technology into my classroom.